Recently my wife, Pat, and I traveled to Medford, Oregon, to attend the annual Roxy Ann Gem and Mineral Society show. I am the California Federation of Mineralogical Societies Membership Chairman, so we travel to numerous California shows to display our case while concurrently allowing me to learn more about the various gem and mineral societies and their activities. Because our granddaughter lives in Medford, this allowed us to turn a visit with her into an opportunity to see how societies outside our federation conduct their shows. While we were setting up our case, a younger gentleman was setting up a case adjacent to ours. A quick glance into his case revealed an exceptional glyptic artist that carves in reverse intaglio. His name in Jack Hoque. After seeing his fantastic work, I decided to learn more about him as well as the type of work that he does. 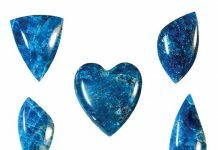 The carving of images on gemstones falls under the category of glyptology. The term derives from the Greek word glyptos – to carve. Glyptology includes carving an image on the front of a stone by removing the outer surfaces, leaving a raised image. The result is called a cameo. This recently-completed piece showcases a multi-headed dragon. The reverse of this method is where the image is carved into the surface, leaving a negative image in the piece. This is called an intaglio, pronounced in’taly?. Cameos are often carved on pendant-sized pieces, and intaglio pieces are often sized for use in rings. Inscriptions carved into stones result in making them into intaglio pieces. 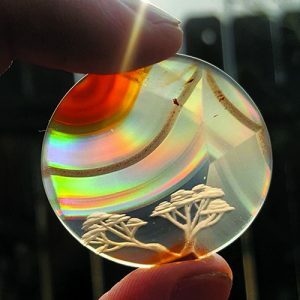 The work produced by Jack Hoque is called reverse intaglio because it is carved on the reverse side of a transparent gem material, usually a clear quartz crystal. Carving images on stones dates back at least 15,000 years, and at that time it was a crude means of communication. In ancient times, carving intaglio images of royalty served as a means to seal and authenticate a document. The document was sealed with a wax that would have the intaglio stone pressed into it so a raised image was left behind. This would identify the sender while securing the document. In the late 19th and early 20th centuries, reverse crystal intaglio carving became popular with the images carved being painted with realistic oil paint colors and patterns. The back of the cabochon was then sealed so that the painting was preserved as the piece was worn. The technique was developed by Emile Pradier in the 1860s in Belgium. Sometimes, signed pieces of Pradier’s work are found by current collectors of his artistry. As time went on, the technique became popular in England. The rough quartz crystal material, usually from Brazil, was first formed into a cabochon shape, sanded and polished on all sides including the back. Following this, the images were painted on the back and then painstakingly ground into the back with minute scribing tools utilizing a diamond paste. The deeper the carving, the more desirable they became. Upon completion of the grinding process, the pieces were painted with very fine brushes and paint to bring out the images. Men preferred images of things they hunted such as foxes, rabbits, and birds. This piece of jewelry was fabricated by Jack from 14K gold. The stone is sunstone and the reverse intaglio image is that of a anatomical heart. Additionally, they liked images of horses. Women preferred birds, insects, and monograms. These pieces were worn like any other gemstone jewelry popular with the times, such as stick pins, buttons, cuff links, charms, and lockets. They remained popular until glass and plastic imitations came on the scene in the 1920s. Jack initially started working in the grocery business, but he kept an image of being an artist in his mind. As a youngster of seven, his father took him on tours through the Roxy Ann Gem and Mineral Society’s lapidary workshop. 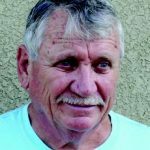 That interested him a lot, but it wasn’t until later in life that the inspiration to learn lapidary and jewelry-making struck him. Early in Jack’s life he knew he always wanted to be an artist, but he wasn’t sure which particular path he would take towards that goal. Five years ago, Jack found an opportunity to become an artist when he joined the Roxy Ann Gem and Mineral Society. It was in the Society’s workshop area that he took classes to learn lapidary and jewelry-making techniques. He also served in various leadership positions within the society. The society owns and operates the Crater Rock Museum in Central Point, Oregon, which is a few miles north of Medford, where the Society’s show was held. The museum and the Gem and Mineral Society were featured in a fantastic and comprehensive article in the December 2013 issue of Rock & Gem magazine. 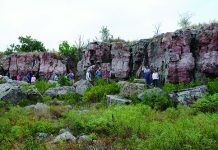 The museum is a premier site to visit if you are interested in studying rocks, minerals, fossils, and the history of the local Native American people who inhabited the area for many thousands of years. 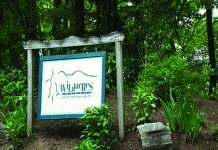 The museum evolved from Delmar and Freida Smith’s rock shop and store. Throughout the evolution of the store and museum, there existed a shop where the early members of the club could learn and work on lapidary and jewelry projects. It was in this shop that Jack honed his early artistic skills. 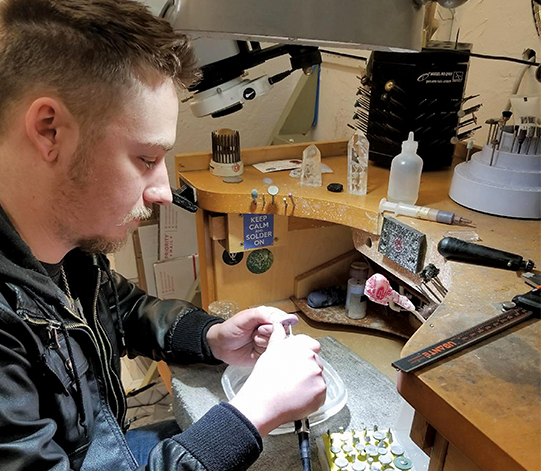 He also apprenticed for two years to “Bee” Jakkarin Iamnok, who is a bench jeweler at a store in nearby Jacksonville, called Jacksonville Gems and Jewelry, where he currently works. Here his career evolved into his current profession. This is a cabochon of an agate with a phenomenon called iris agate. Jack carved the trees from the back. In 2017 and 2018, he attended the 22nd Street Gem Show in Tucson, Arizona, to acquire the raw materials for his work, primarily quartz crystals but also any additional transparent materials that were available. He started working in reverse intaglio in June of 2017, and he is self-taught. His inspiration to do this type of work came from seeing the reverse faceting work of Dalan Hargrave and reverse intaglio by Christopher Ser. His pieces start out as a vague idea of something like a dragon and evolve during the carving into a detailed image, often with enhancements from a different time. One piece has a carving of Big Foot with a futuristic space ship hovering over him. This juxtaposition of a contemporary image with a futuristic image is a frequent theme of his pieces. Each one of his creations is unique and never repeated with another copy. All of them are a freehand carving and not copied from a picture or drawing. The details in his images are very precise and well-crafted – like the multi-headed dragons in a recent piece. He often has a nautical theme, including one with a multi-tailed, prehistoric fish going after a golden prey. Jack often mounts his work in silver and gold. When he fabricates pieces, he starts with an ingot, forges it, and runs it through a rolling mill. From there, he hand-forms the metal into sheets or wires from which he fabricates the individual pieces for the item of jewelry. One silver pendant was created around a narrative called “The Life of Water.” The top segment was made from sunstone, and it has a carved image of the sun. The next element in the design is a carved image of clouds representing gaseous water, followed by a snowflake representing solid water, then a water molecule in a piece of aquamarine that represents liquid water. The final segment is a carved image of the moon in moonstone. On one of his pieces titled Forever he depicts an earlier time in a couple's lives and proceeds to later in life. reveals a reverse intaglio image is of an anatomical heart. The heart is surrounded by abstract designs. Although much of his work involves quartz crystals, Jack also works in other materials. He cabbed a piece of moldavite, and he left some of the natural surface features on the back. Those natural features helped frame a carving he did of an anatomical heart. Jack frequently does an engraved image on the back of the silver mounting that compliments the carving on the stone. In one case, the front is a cabbed piece of citrine with the reverse intaglio depicting a couple in a tree swing. His creations are formed in a simple and orderly workspace. He has some holders for various diamond bits, a deep, rectangular plastic bowl with 1-1/2” of water in it, and a flex shaft with a “V”-shaped diamond bit in it. He carves with the back of the piece facing upward. He uses a 6mm-diameter diamond wheel to do the rough layout of the basic shapes and then adds the details with a 3mm bit. Sometimes he uses ball bits to clean up the details and the rough edges. He usually finishes the layout on a piece in about 1-1/2 hours. The complete process can often take a few days to clean up and finish. On one of his pieces, titled “Forever”, he depicts an earlier time in a couple’s lives and proceeds to later in life. The earlier time is done in the silver work on the reverse of the pendant with the couple holding hands with a sun and moon as added accents. On the front, the stone is made of rose quartz. It depicts the later times, which are portrayed in the reverse intaglio image by showing an aged couple with the man walking with a cane and holding his companion’s shoulder for support. The accent to this scene is an engraved image of a clock face. Again, this is an example of the common theme of storytelling in miniature. 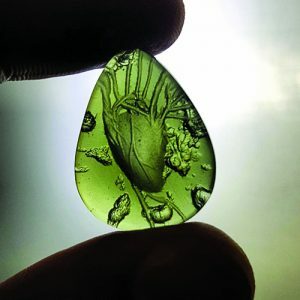 Throughout my discussions with Jack, he frequently made it clear his mission is to share anything he knows with anyone who wants to learn the techniques he uses in making reverse intaglio creations. Jack cabbed a piece of moldavite and left some of the natural surface features on the back. Then he carved an anatomical heart amidst the natural features. 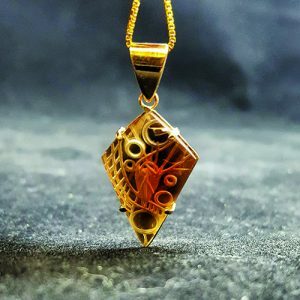 In conjunction with a professional studio, he produced a six-step subscription video program that includes describing the diamond tools needed, the materials used, and safety practices to follow during the making of the creations. Also, there is a discussion on the most effective methods of using a flex shaft machine while carving. The video also includes discussions on how to hold the piece to keep it wet while applying the diamond burs to the piece. 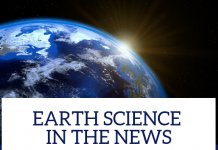 There are details on which diamond burs to use to get the shapes and textures of the images being created as well as how to create planets, trees, ships, and other various forms. Finally, Jack describes the finishing techniques needed to ensure the highest quality final product. 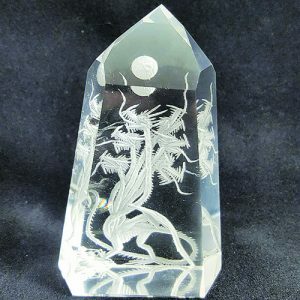 The course is called “How to Carve Reverse Intaglio into Quartz and Glass.” It can be found at curiousmondo.com/reverse-intaglio-course. 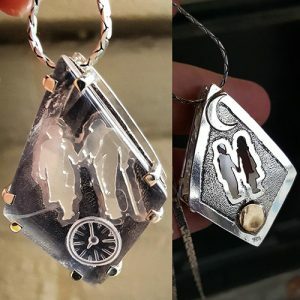 Jack sells his finished creations on a website called geomancygems.com and on Instagram@forged_elements. A professional within the lapidary industry since 1958 and metal work and jewelry since 1972. He teaches at clubs and at Camp Paradise.